HYEFIGHTER DANIEL SARAFIAN INJURED!!!! Sarafian suffered an arm injury in the time between the show’s filming and this week’s event, and he will be replaced by semifinalist Sergio “Serginho” Moraes. HyeFighter Daniel Sarafian is a Brazilian-Armenian professional mixed martial artist who competes in the middleweight division. A professional MMA competitor since 2006, Sarafian has fought mostly in Brazil and in the United States, including a one-fight stint in Bellator Fighting Championships. He is currently signed with the Ultimate Fighting Championship (UFC), competing on Globo’s The Ultimate Fighter: Brazil. Sarafian started training martial arts at five years old under his grandfather who was a black belt in judo. Sarafian took solely judo classes until he was ten years old when he began training karate. At sixteen he began taking lessons in Brazilian jiu-jitsu. After entering high school and getting constantly picked on for being overweight, Sarafian began working out and training MMA. Only a couple classes into MMA, Sarafian “fell in love with fighting”. Sarafian made his professional debut at Predator FC 2 against Jorge Luis Bezerra, winning the fight via submission in round three. In his next bout, he agreed to fight UFC and Strikeforce veteran Mike Whitehead. Sarafian lost the fight via unanimous decision. After his bout with Whitehead Sarafian was asked to take a fight for District Combat Promotions, a small promotion based in the United States. Sarafian took the fight and won via submission (armbar) in the third round. Sarafian stayed in the United States and fought on the Texas’ promotion, Xtreme Fight Championship. He fought Cedric Marks and won the fight via submission in the first round. Sarafian then signed a one-fight deal with Bellator Fighting Championships to compete on their first fight card of their inaugural season. Sarafian fought Gary Padilla, losing in the second round via referee stoppage. Sarafian racked up four straight wins before signing on to take part on The Ultimate Fighter. In March 2012, it was revealed that Sarafian was selected to be a participant on The Ultimate Fighter: Brazil. Sarafian defeated Richardson Moreira via decision to move into the Ultimate Fighter house, and become an official cast member. Sarafian was selected as the third pick (sixth overall) by Vitor Belfort to be apart of Team Belfort. In the first middleweight fight of the season, Sarafian was selected to fight Renee Forte. Sarafian dominated the fight and won via rear naked choke in the second round. In the semi-finals Sarafian was selected to fight Sergio Moraes. Sarafian won the fight in the first round via KO after hitting Moraes with a flying knee as he dropped for a take down. The win moved Sarafian into the finals of the middleweight tournament, set to take place at UFC 147. 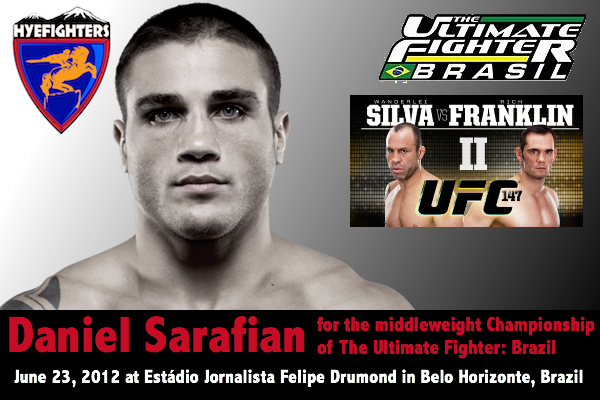 Sarafian will officially make his UFC debut at UFC 147 on June 23, 2012 to determine the middleweight winner of The Ultimate Fighter: Brazil.